Standard frames are approximately 12" deep. 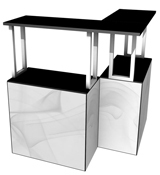 All frames, podiums and counters are priced without Quads. All frames are prepared double sided. MAX frames are approximately 23" deep. Note: Thin Frames must be supported by Standard or MAX framework on at least one side. Thin frames cannot hold any accessories. Extended Frame Kits include the frame and frame clip. For example, a 1x1 Standard Extended Frame Kit (MQ-EF11) contains (1) MQ-F11 frame and (2) clips. 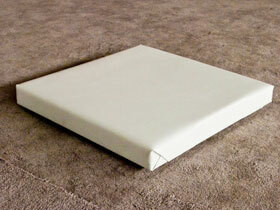 These frames will have Loop Velcro® installed on one side (bottom) and standard metal tape on all other sides. Coverings (Quads, shelves and lights) sold seperately. 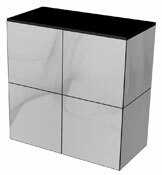 Note: Counters are simply a 46" tall frame with a countertop. The standard shelf is black ABS. 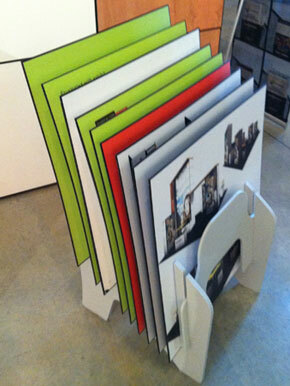 Custom colored and translucent shelves are available. Standard tops are black laminate. Custom colors are available. 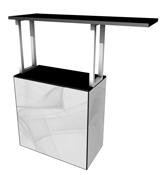 1x1 podium frame with shelf & overhang top. 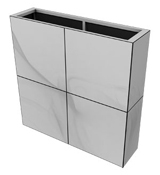 Overhang tops have one side flush & one side extending past the frame. 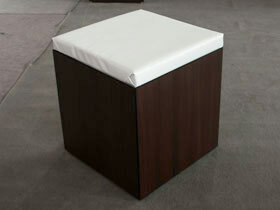 *Standard Quads include printed colors, wood grains and Velcro-receptive fabrics. 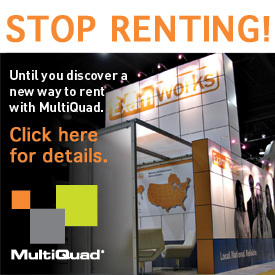 Call for availability and pricing on non-standard Quads. *CVHs are vertical beams used to support Quads in (2) Standard Quad wide frames. 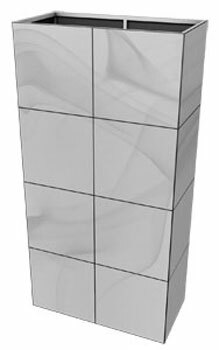 All towers and frames come with CVHs on front and back. *One Quad wide frames hold 19" Vizio® monitors. Two Quad wide frames accept 22" Vizio monitors. A two Quad wide MAX frame holds a 42" monitor. 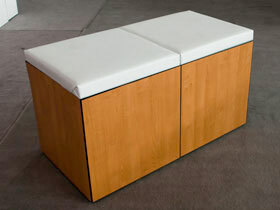 *Counter tops 3/4" plywood with black laminate. Custom laminate colors are available. Anywhere a Quad attaches can easily become a back-lit graphic. 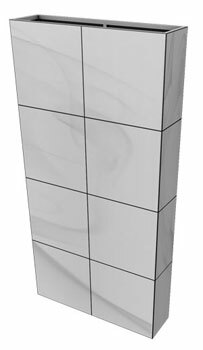 Simply order GRA-Q5 ($130) in place of a standard Quad, add an LF91MQ fluorescent light ($80) and you have a back-lit graphic Quad. Full details on Backlit Quads. 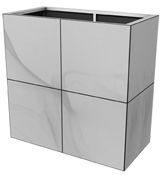 Request item MQ-CTCC to change your standard black laminated counter top to a custom color. Most vertical grade Pionite® and Wilsonart® laminates will work. Call for pricing and availability. 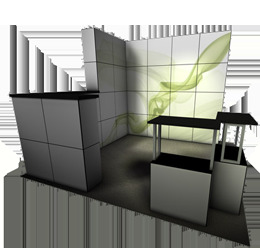 If you need some additional help visualing how to use components, check out our 10’ and 20’ pre-designed kits for an overview. 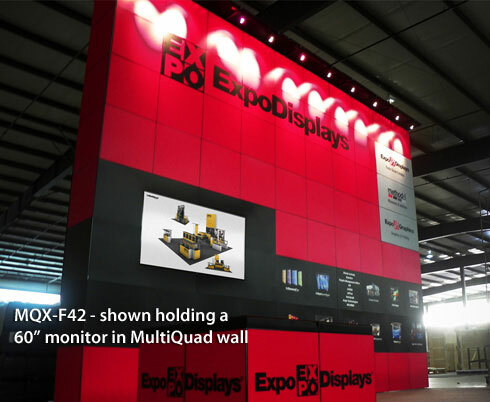 Any 2x4 MAX frame can use MQ Media Mount technology to safely hold a 42" monitor flush with the Quads so that only the monitor screen is visible. 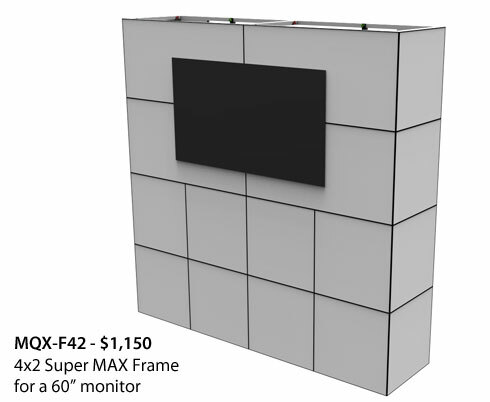 Order the MQ-SM3Q monitor mount ($650) and replace four standard Quads with four FRA-QTV42 Quads ($85 each). 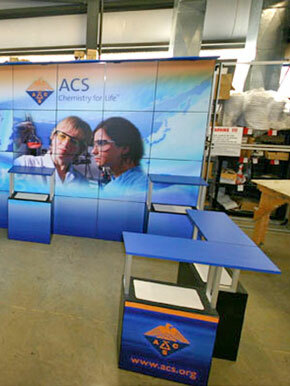 Add the 42" monitor (call for models that will work) and you have a BIG interactive presentation. Item GRA-QRS ($60) adds an 18" square graphic to the back side of a Quad. 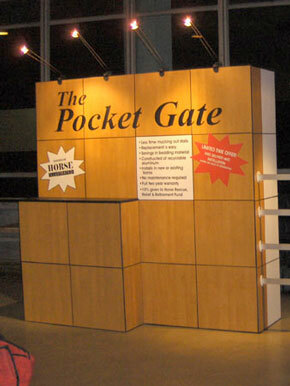 Use this to show visitors confidential or technical information when you are ready to show it. 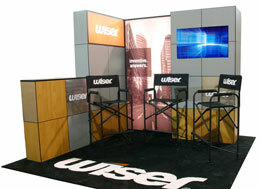 Use it to have photos at the show without cluttering your exhibit. 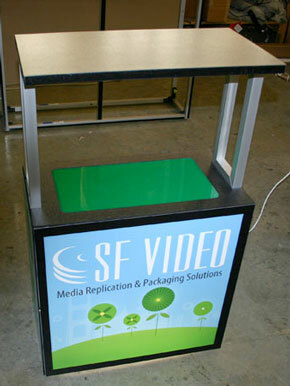 Have a product or service on the front of the Quad and put the technical information or pricing on the back. When you have an interested prospect, simply remove the Quad and show them the back. It is like a brochure without all the clutter or a price list that cannot end up in the hands of your competition.